Today is Memorial Day in the U.S., a time to remember those who died so that bloggers, social media users, and ordinary people could “have their say” online or anywhere else. For me, it’s also a time to remember those who had the forethought and care to put our right to free speech into our constitution, enshrining forever the idea that a government of the people, by the people, and for the people shouldn’t try to censor what we believe, think, write, or say. That’s really all that I have to say today besides offering my heartfelt thanks to the heroes of yesterday and today, known and unknown. 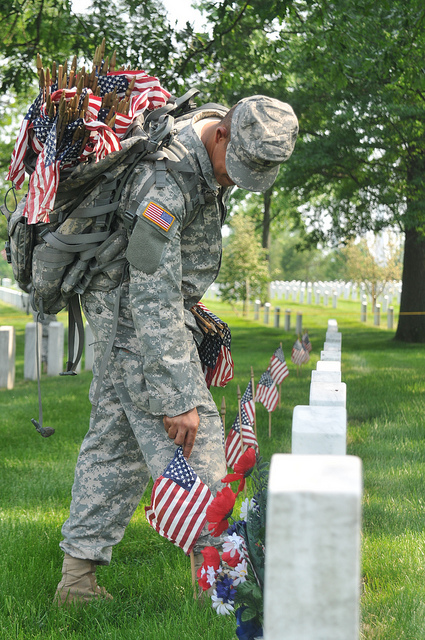 The moving photo below was taken May 26, 2011 at Arlington National Cemetery during the annual “Flags In” ceremony performed annually since 1948. Spc. Brunel Carvalho, of the 3rd U.S. Infantry Regiment (The Old Guard), is shown placing the flag. An anonymous photographer made it available through a Creative Commons license on Flickr.